Re: Your CV Has Been Shortlisted! Vacancies at Structure Edge Constructions Limited, Ghana. Structure Edge Constructions Ltd is among the leading construction firm across west Africa. Basically, we are recruiting for Ghana project 2010 - 2012 as there is an ongoing massive project here in Ghana. The details and the parameters of the contract shall be mentioned if selected. As per your profile which we review through our recruitment partner (http://www.monster.com, naukri.com,and jobchina.com), your CV have been shortlisted as one of the applicants that we will need for our 2010 contracts which will commence from ending June 2010. Please do not hesitate to forward your Curriculum Vitae/CV if your area of expertise is not mentioned here as it might be reprimanded by the board of directives. (1) Must know how to speak English language. Fluent, good or little. 3. HOW DO YOU SEE YOUR PREVIOUS EMPLOYER? 4. WHAT MAKES YOU TO LOOK FOR A NEW EMPLOYMENT? 5. 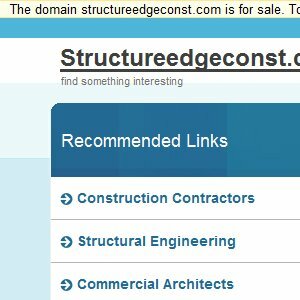 WHAT ARE YOUR EXPECTATIONS WITH STRUCTURE EDGE CONSTRUCTIONS LTD? 6. WHAT WILL YOU LIKE TO HAVE AS YOUR MONTHLY SALARY? 7. DO YOU HAVE ANY PROBLEM RECEIVING SALARIES IN OTHER CURRENCIES? 8. DO YOU WANT TO TAKE EMPLOYMENT WITH US BECAUSE OF FINANCE? 9. WHY DO YOU WANT TO TRAVEL DOWN TO OTHER COUNTRY TO WORK? 10. WHAT ARE THE THREE MAIN THINGS YOU ARE TARGETING TO DELIVER TO THE COMPANY, IF SELECTED? 11. CAN YOU BE ABLE TO START EMPLOYMENT AT TIME WITHIN JUNE & JULY 2010, IF SELECTED? Note: You are required to be very punctual in checking your emails as we might be emailing you any moment if selected. Also, we are going to provide traveling documents/work permits and flight tickets to selected applicants. Nevertheless, there would be a two weeks work orientation to each applied and selected candidate. We wish you all the luck you need in your application screening. The sender of this email is registered with naukri.com as Structure edge (info@structureedgeconst.com , 94 S. Madison Drive, Pensacola - 32505) using Naukri.com services. The responsibility of checking the authenticity of offers/correspondence lies with you. You can also Block this Company from searching your resume in the database. Advisory: Please do not pay any money to anyone who promises to find you a job. This could be in the form of a registration fee, or document processing fee or visa charges or any other pretext. The money could be asked for upfront or it could be asked after trust has been built after some correspondence has been exchanged. Also please note that in case you get a job offer or a letter of intent without having been through an interview process it is probably a scam and you should contact abuse@naukri.com for advise. On this note, we congratulate you on the success of your application and as such we have attached to you the Offer Letter/Terms of Contract Agreement that transcends any written document with the company. However and in accordance with the company's consensus for the newly recruited, you are strictly required to follow the guides and procedures as stated below to complete your Employment formalities. You are to endorse/sign the contract document (in the space provided at the bottom of the last page) and forward it accordingly to the legal department for the recognition and confirmation of your acceptance of offer. As a newly recruited employee, you are required to contact the Lend Span Financial Services on issues regarding the procurement of your traveling documents. Their objective is to alter financial support for the procurement of your traveling papers. Their directives and assistance would enable you to obtain a valid ECOWAS Residence and Work Permits/Identification card with the Ghana Immigration Services/Agents before you embark on your journey to in Ghana. You are to use the below stated details to contact along side a copy of your endorsed employment/contractual agreement documents. 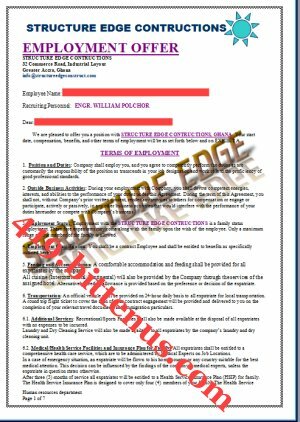 Note that this procedure must be followed and completed Immediately as the completion of this procedure confirms you as a genuine and bonafide employee of the Structure Edge Constructions Company.